There is always a limitation on how much a collector can tolerate. Let this be the last redeco, Bandai. Lazuli (2 jaar geleden) #20164838Bandai did made the Original Animation Color as a Lottery Exclusive and there's still the possibility of this being released as that. I don't thin so...this was showed two years ago. Bandai would have release her at some fair like an exclusivity but this hasn't happened. Bandai did made the Original Animation Color as a Lottery Exclusive and there's still the possibility of this being released as that. With Super Mercury been on her way, THIS NEEDS TO HAPPEN. With this release I want this Bandai, this is money maker and not the Crystal version. I'm pretty sure they are canceled... at least the Moon R version for sure. She was announced next to Black Lady and Black Lady it's already out so yeah, bye Moon R.
I think that the Crystal line will erase some forms that would've come with the 90's design. 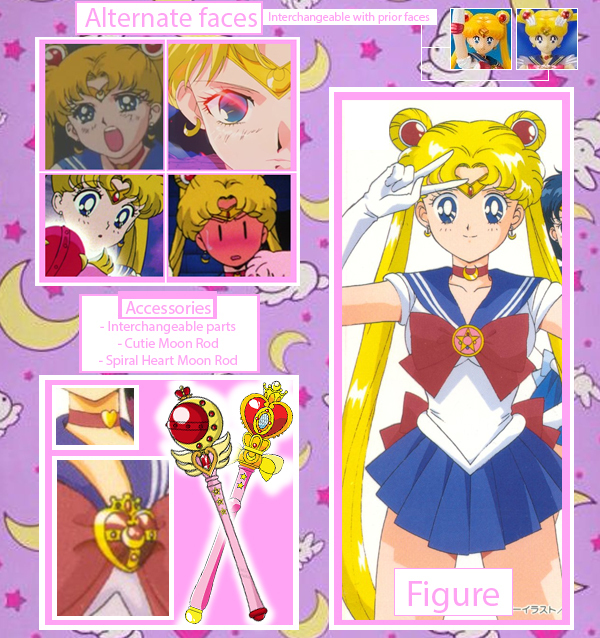 For example, the Sailor Moon S version ( it was never announced ) now will never happen cause this Crystal version has the Moon Cosmic Heart brooch. Same with Super Moon Super S version...I'm pretty sure that next year with the Dream Arc of Crystal they will release Super Sailor Moon and Super Sailor Chibi Moon Crystal version. I'm very sad about this... for one side I'm happy cause they are continuing with the line but from the other side all the forms that maybe would have happened with the 90's design now will never happen. I think that they will release the Super form with Crystal design. This way they offer " something new " with new designs ( both inners and outers senshi ) to all the people who where mad because of all the small changes with super mercury. No news for a year about the Mercury, so... It is obvious, Bandai will not release this. nick_clark (2 jaar geleden) #14193118did it! is this new? Yes it sure is! templariuS (2 jaar geleden) #14182481p-bandai.jp/enq... please answer to bandais oficial pol to let them know what figures we want next!!! Great news you guys!! Use an online traductor and let them know we want more and more characters!!! Specially villains! did it! is this new?